How often does my child need to be exposed to his minority language? If you are looking for an answer to that title, let me tell you straight away, this article is not going to tell you. 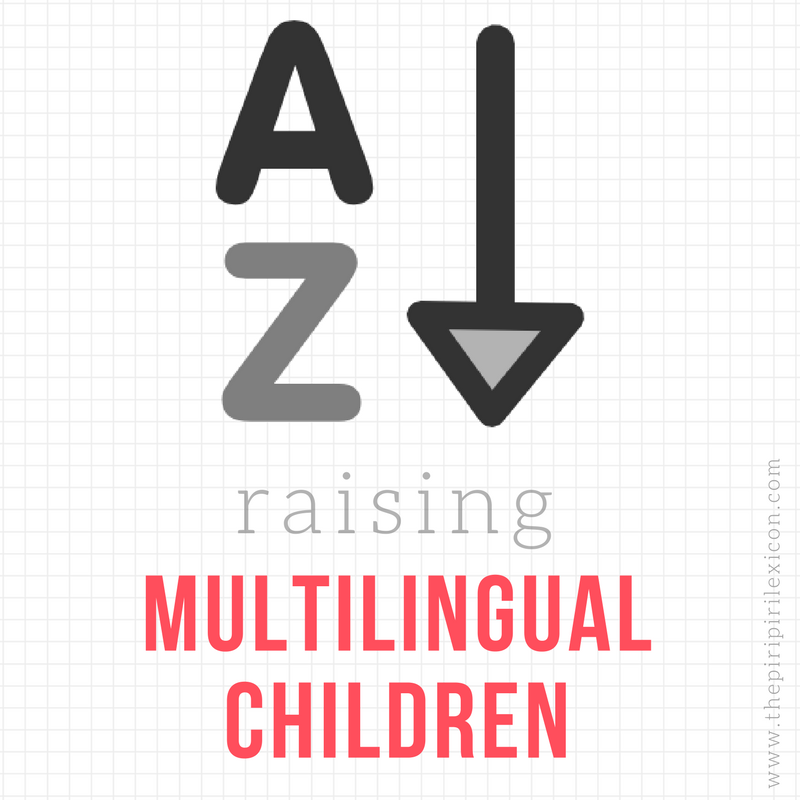 Recently, however, there has been an (alarming) number of articles and posts on the internet, aimed at parents raising mutlilingual children, claiming that a child needed to be exposed to, on average, a minimum of 30% of their awake time to the minority language in order for him/her to be able to use that language. Now, I am not disputing the fact that there may be a cut-off point below which acquiring the language may be difficult beyond the use of a few basic words by the child. But there are so many things wrong with this statement that I feel it is a very dangerous one to present to parents. But, let me come back to the statement and its origins first. The various versions of this myth claim that "a child needs to be exposed to a language for a minimum of 30% of the time spent awake in order to start (and continue) using the language actively" or that "20% input is the minimum for successful language acquisition" or that "less than 20 hours may make it difficult for the minority language to keep pace". As a researcher, I cannot help but think that quoting this number because someone else quoted it is not proof enough that it holds any truth. I need scientific evidence. It seems that this statement could have originated from a misquote from Fred Genesee, a Canadian leading academic in terms of bilingual language acquisition. 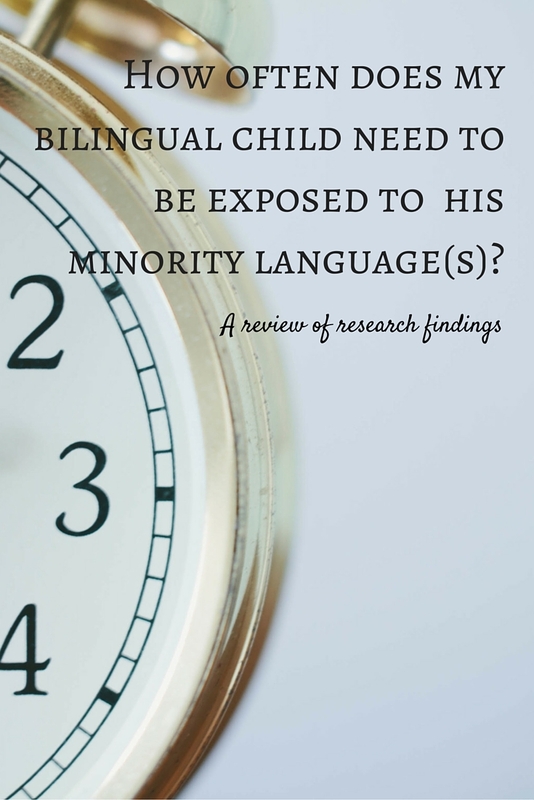 What Genesee actually stated is that when his team of researcher choose participants for their studies on bilingual acquisition, they choose children who are exposed to at least 30% of their minority language. It is a decision they have to make to ensure the children are growing up bilinguals. A lot of other research teams use a similar selection point. Pearson's research team, for example, uses 20% as a cut-off point and she mentions it in her Raising a bilingual child book (p. 116). 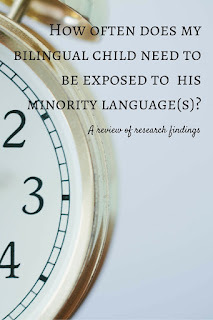 What they did NOT say, however, is that you needed to be exposed to at least 30% of your minority language to be bilingual or to acquire it or that it should be a target for families. Big difference, in my opinion. As I mentioned before, there are many things wrong with this claim. - How can you accurately measure exposure time? 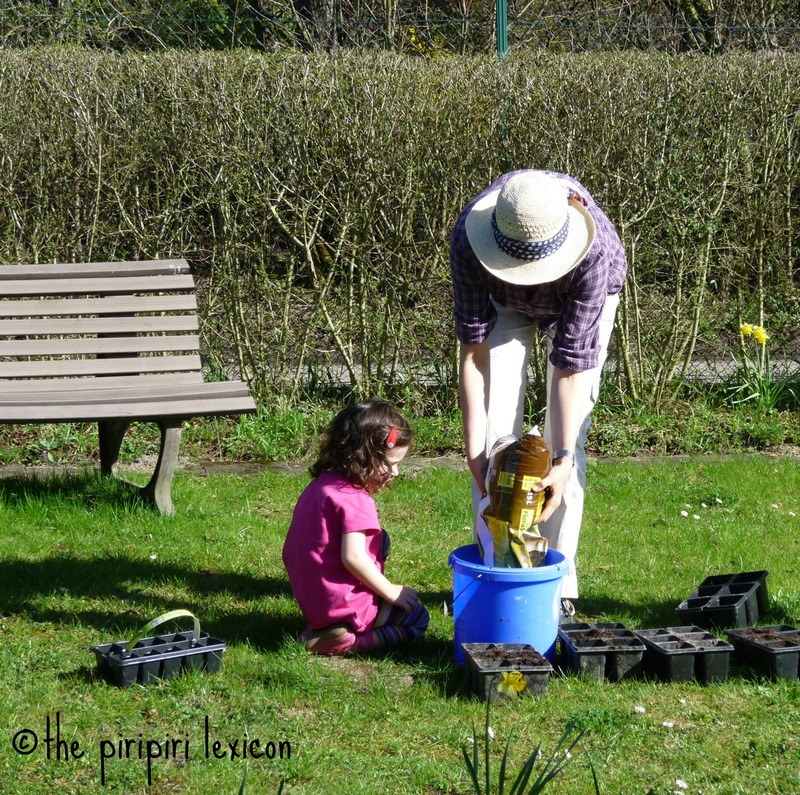 How about thinking time, quiet time, play time when we are not around to overhear? How can you make sure when you read to your child in English, he or she is not thinking in their other language and translating in their head? LJ spends 2 hours in the morning before going to kindergarten with me and her father. I speak to her in French, her dad speaks in Portuguese (with some English) and as a couple we speak English. How on earth do I quantify that? Would you have to count words we produce? - How about trilinguals or quadrilinguals? My daughter stands no chance with this myth. She is exposed to 4 languages and mathematically, if she had a perfectly balanced exposure, she would get 25% in each language, leaving her little chance according to this myth. Now, even if I can quantify her input approximately, I could come up to the conclusion that she is exposed to French about 30% of the time and less of the other languages. Her German clearly stands little chance then (and let's not even mention her Portuguese or English). Yet, I cannot help but feel that her German is growing faster than any of her other languages at the moment. - What ages are we talking about in this myth? It is unclear. Genesee and Pearson tend to work with very young bilinguals (somewhere between 6 months and 5 years old). I am not sure they would apply the same criteria to older kids. Until what age, should we have this balance of languages? How do we measure it over time? Life is rather unpredictable and language balance often shifts over time and at different times of our lives as we move country, start school, get a job, etc. - What are the languages used for? Different languages of a multilingual are used for different purposes. We may not need the same amount of exposure or type of exposure to each language. After all, does it matter that my daughter is only exposed to 11% (I am making this up) of her awake time to Portuguese? All she needs it for is to talk to her Grandma over Skype once a week and for a holiday once a year. She may understand enough for that. The truth is there is very little scientific evidence about minimum exposure time in bilingual children (and even less, if any at all, for multilingual kids). Almost all of the evidence on the topic is anecdotal. First of all, the research evidence indicates quite clearly that the reduced input that results from exposure to two languages during the preschool years does not impact certain aspects of language development in simultaneous bilingual (grammar, for example). One of the only studies, to my knowledge, on the topic is that of Thordardottir (2011). She suggests that bilingual children need at least 40% of waking hour exposure to a language if their competence in that language (as measured by words production and comprehension) is to be comparable to that of monolingual children, WHEN assessed using standardized tests. But this not even true for all aspects of words acquisition they studied. However, even under optimal conditions (50:50), a bilingual's languages may differ from that of a monolingual because their communicative needs are different. A bilingual almost certainly uses their languages for different purposes. We really need to stop comparing multilinguals to monolinguals as if these are the reference and multilingualism is a disorder!! So, stop obsessing about numbers and remember that the seed planted may take time to grow, but it is there and can be reactivated with a little water, nutrients and care whenever needed. I would like to thank Madalena Cruz-Ferreira for sharing her views on the issue with me. I am solely responsible for everything written here though. Thordardottir, E. (2011). The relationship between bilingual exposure and vocabulary development, International Journal of Bilingualism, 15,4, 426-44. Great article! And I am guilty of believing in this myth of 30% exposure. I appreciate your explanations and totally agree that bilingualism and multilingualism aren't a science of percentages. But kids do speak another language based on a combination of exposure and need. 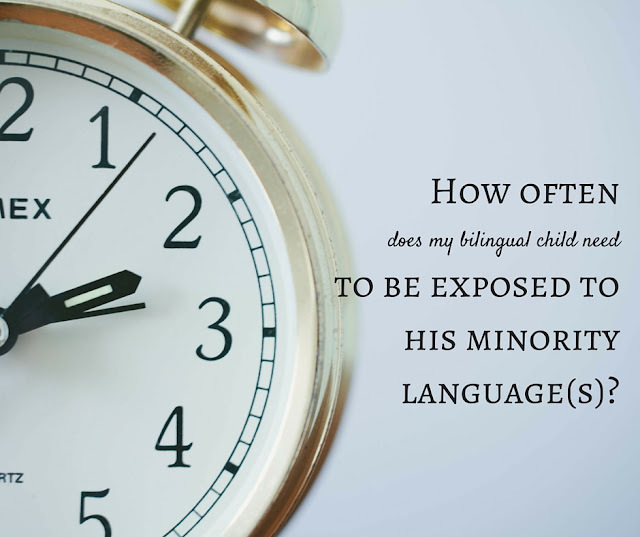 So it follows that a kid who is more exposed to the minority language on a daily basis (thus a higher percentage of time) would be more apt to speak their minority language than one who is less exposed, no? I know my kids roughly 20% Arabic input per day (rough estimate) is not enough. Whether a rough 30% is the tipping point, I am not sure either. So while I agree you can't really quantify bilingualism and language exposure because there are so many other factors at work, I also still have the sense there is a certain amount of input that is the needed amount to raise balance bilinguals/multilinguals. The question is really around how much is that and whether it's possible to quantify it. From everything you wrote, it seems the 30% measure is not necessarily a myth so much as based on anecdotal evidence as there hasn't been enough scientific evidence to prove or refute it. Is that right? Maybe since I like numbers, I like thinking that this approximate 30-40% tipping point is all they would need to be more fluent Arabic speakers (vs. passive listeners)...so is it really such wishful thinking? I look forward to hearing your thoughts! Yes, this 30% is based on anecdotal evidence. There is no scientific proof so far. And I am a scientist. i like proofs! It may hold some truth and be as you say a tipping point but to date, it is purely a myth. More seriously, my issue is more about quantifying. I am struggling to see how we can quantify multilinguals' language input. How can we find a real measure that will work? How do we know what language kids play in, think in? At kindergarten, my daughter hears French and German, how on earth can we quantify this accurately? Would we need to count number of words she hears? It seems difficult. Thanks Annabelle! I appreciate your getting me thinking me more about this idea and pointing out there is no firm evidence behind the 30% exposure idea (Note to self to edit a post I wrote that mentioned it and link to this article!). Yes, quantifying especially for multilingual kids is definitely not possible. The problem I see with these kind of studies is that it puts tons of pressure on the parents: Oh, your child doesn't speak the language? Obviously, you didn't talk to her enough! And then the parents worry whether their children get enough exposure or not...This is what multilingual parenting has in common with other parenting philosophies- making parents feel guilty, as if they didn't already feel guilty enough for working/not working, breastfeeding/ not breastfeeding, etc... and also, parenting can't be quantified, can't be translated into numbers. Our children are not machines! Thanks for this post, Annabelle, awesome! You commented on one of my posts at one point about this issue, and I am happy to see a fleshed-out explanation. I remember that one source was the book 7 Steps to Raising a Bilingual Child by Dr. Naomi Steiner, I might have also seen it in The Bilingual Edge. I think in Superbaby she gives the number 20%. I know I repeated the number because I find it reduces my anxiety to have any target, it is so hard to know how you are doing in a journey that is so personal, so unique, so multi-faceted for each family. 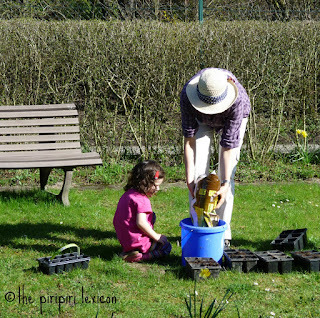 I also think having a target would be motivating when our French-speaking is encroached on by classes and play dates and it will take effort to meet other French speaking families. It is certainly good to know that the number is not based in science though, and that it certainly should not be a source of anxiety! I can understand and relate to the idea of comfort behind the myth. But as there are no scientific proof, I find it dangerous to propagate it in a way that tells parents below this level, you have little chance of success. I am in no way claiming it is completely untrue, but I want scientific proof before it is held up. Annabelle, thank you for this really interesting post and series of comments. On the one hand I am relieved that the number is not set in stone - though arguably when it comes to kids, nothing ever is since each child is so different. Like Stephanie, I used it more as a guideline and it helped me make an effort to increase my kids exposure. For me the 30% was never so much about what was going on in their mind or coming out of their mouths but more what they were hearing around them. Anyway I can't wait to check out babelkid's post. And maybe this should be your next research project!! Excellent article Annabelle and you saved the day! One of my readers wrote to me this past week wondering about this very thing. I wasn't sure how to reassure him and mostly didn't have the time to sit down and write and then I saw this little beauty floating around fb land! ;) perfect timing! I think it's high time we removed that awful pressure and just believed in our and our children's abilities to become bilinguals and mutlilinguals even if we can't measure out exactly 30%. Context and quality of language input seem to be far more important than the quantity. Thank you! You have made my day. What a great article, Annabelle! To measure the language exposure has many variations. Younger children can be put in a controlled language environment, however, it changes when they start formal schooling. If the children enjoy the target language(s) they would start singing, watching shows, or reading/writing on their own - that is a goal and that is a journey. That is how we guide the kids along the way and it is beyond the numbers. Very interesting article! And thoroughly researched!